Barcelona midfielder, Javier Mascherano, has revealed that his time at the club was drawing to a close. Mascherano joined the Chatalans from Liverpool in 2010 and has gone on to enjoy immense success in Spain, winning the Champions League twice, La Liga four times and four Copa del Rey titles. His contract expires in 2019 and the 33 year-old now features less frequently under Ernesto Valverde this season even when fit. 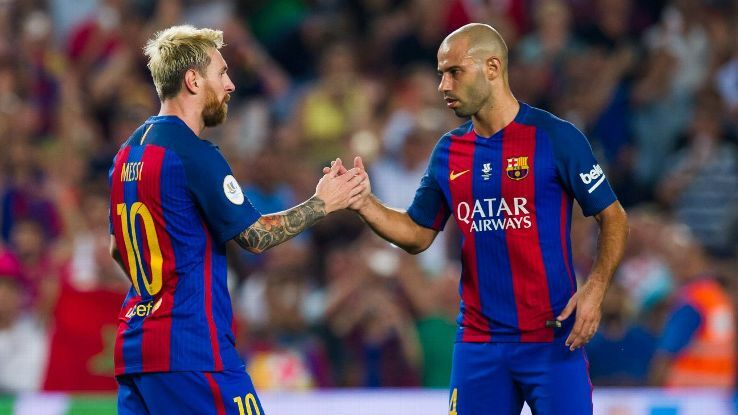 Mascherano is aware that his time in Catalonia is running out. He told ESPN, “I think that my stage here is ending. It makes sense that after such a long time there’s not much more I can do in this club. “I’m not saying it with a heavy heart. I’ve had the best years of my career in this club. I’ll never forget it. “I’m one of those people who thinks that you have to know when is the right time to end a stage. “I would like to end mine [with Barcelona] at the right time, but it doesn’t really depend on me. “I am predisposed to end it on time because when I left Liverpool it wasn’t good for me, and I didn’t like it. “I didn’t like having the feeling that I could go back to Liverpool and there was still something toxic there.